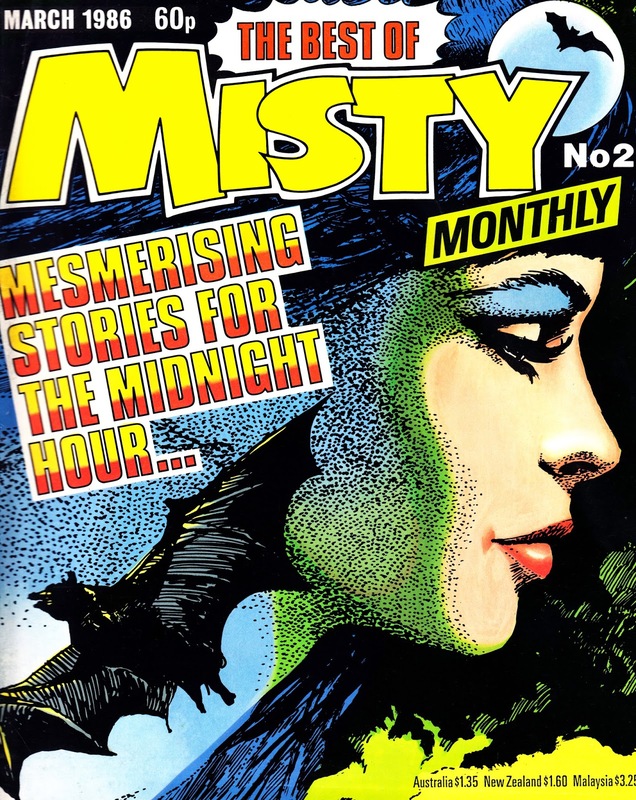 On sale now in 1986: The second issue of the short-lived (but top marks for trying) BEST OF MISTY MONTHLY, reprinting material from the long-defunct weekly. 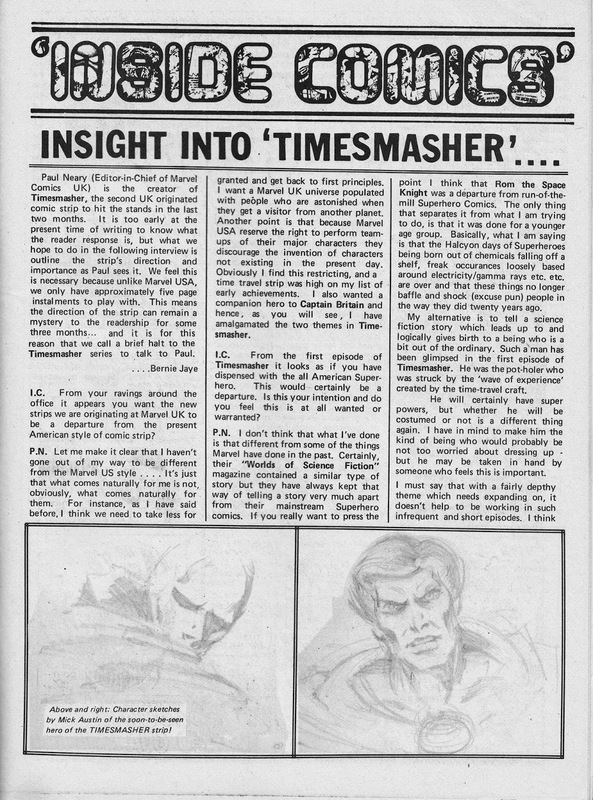 From 1980: MARVEL UK boss man (the first time) Paul Neary discusses the (now long forgotten) British strip TIMESMASHER in the pages of MARVEL SUPERHEROES Monthly. The strip itself appeared in RAMPAGE. This article appeared in MSH 379, cover-dated November. 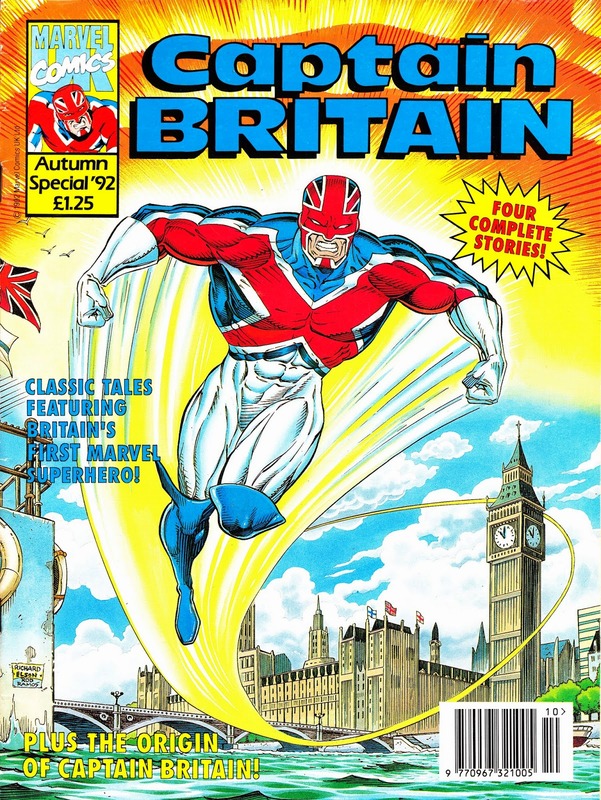 From 1992: CAPTAIN BRITAIN rejoins the MARVEL UK ranks (and regains his own title... albeit only for one issue) with this AUTUMN SPECIAL. The contents are all reprints from MWOM and CB Monthly (but presented here in colour... they were originally published in b&w) but the cover is a brand new piece. 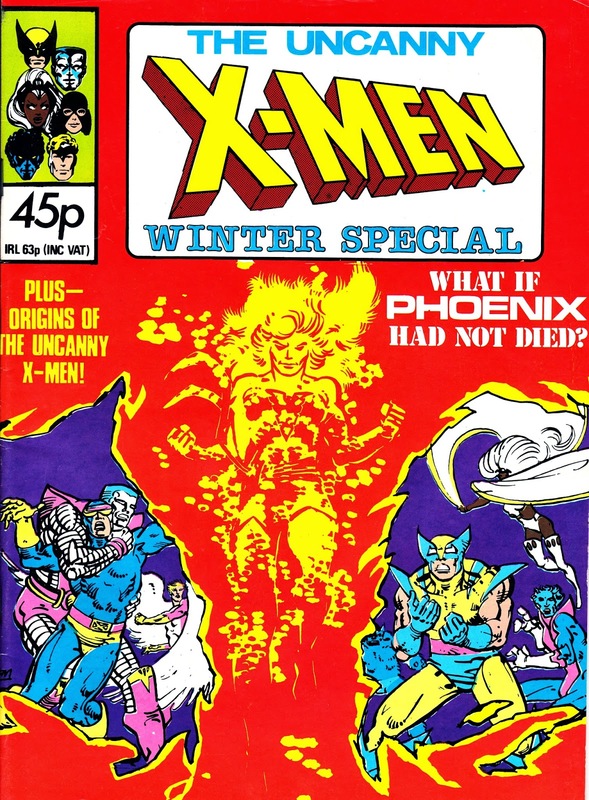 From 1980: MARVEL UK's THE UNCANNY X-MEN WINTER SPECIAL. I've always found the British Bullpen's enthusiasm for running WHAT IF tales in one-shots perplexing. Presumably their appeal rested in their self-contained done-in-one format but, for casual readers, not only were you not getting a true representation of the characters/ continuity but it also relied on a basic knowledge of what had been before to make it work. 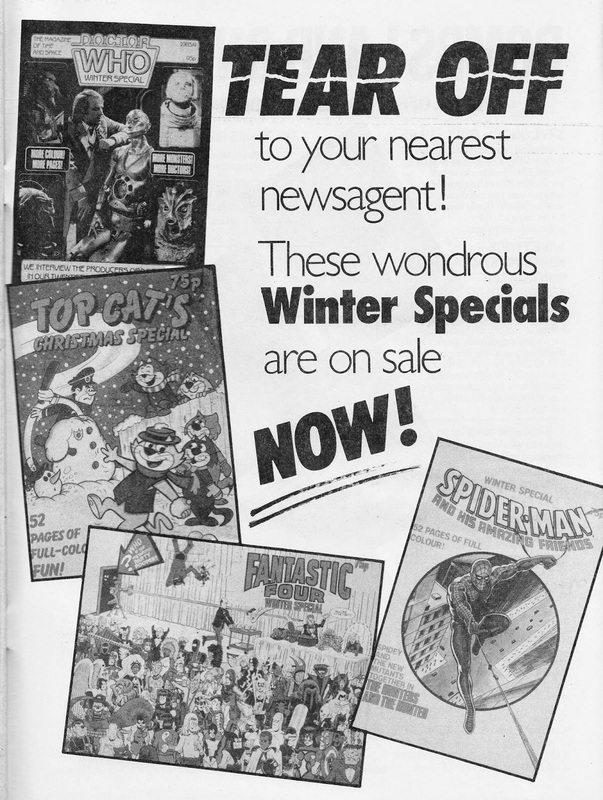 From 1983: A MARVEL UK House Ad for that year's WINTER SPECIALS. The rarest of the bunch is, unsurprisingly, the TOP CAT edition (spun-off from the equally hard-to-find weekly) which I don't think I have seen in-the-flesh. Despite the AMAZING FRIENDS title (the same masthead the weekly was carrying at the time), there's no sign of Ice Man and Firestar in the Spider-man edition. It's justified by the inclusion of the New Mutants (possibly making their UK debut) instead. 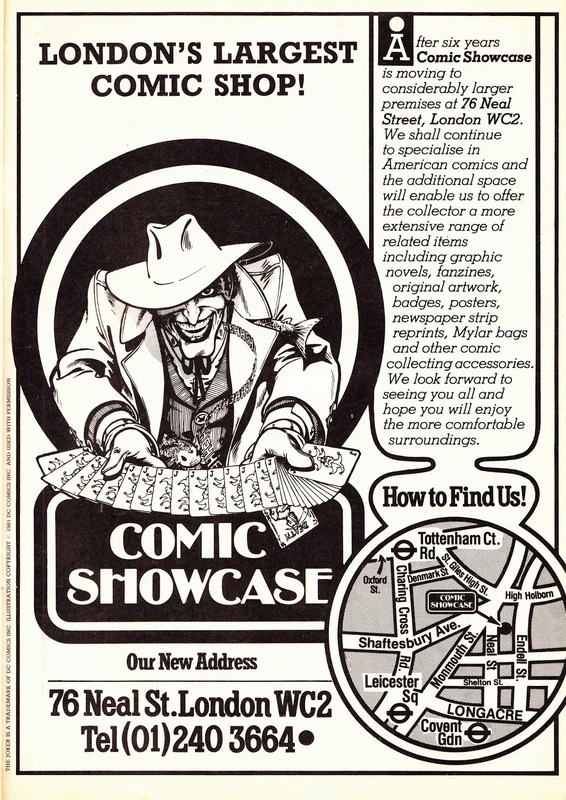 From 1986: an advert for the long-gone London Comic Book emporium COMIC SHOWCASE. Strange to see this shop described as "London's largest" as I always remembered the unit (located just across-the-road-and-around-the-corner from the current FP Megastore) as being pretty cramped inside. It did, however, have a good range of back issues. Something of a rarity nowadays as aggressive trade paperback publishing programmes by the publishers, and now digital, have rendered sitting on large back stocks of slow-moving stock all but obsolete (hurrah for Orbital and 30th Century Comics who remain particularly well-stocked). Showcase latterly moved to Charing Cross Road (just across-the-road-and-around-the-corner from Orbital's home) and a bigger store. Although back issues, except for a few tucked in the seldom-open basement, were now a thing of the past. It closed down years ago although, for a long time, the store signage remained in place even through the store was now occupied by other tenants. 1993: Bring on the clones! 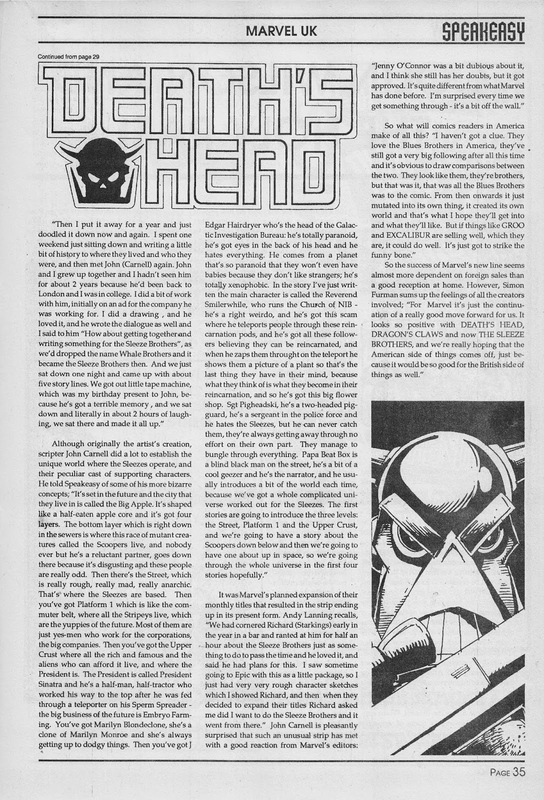 Imitation is the surest sign of success and MARVEL UK certainly tried to make the most of the initially perky sales of DEATH'S HEAD II by knocking out several in-house immitators. Great art on this Summer 1993 House Ad from the US-format books. 1982: Get yer glitter out girlfriend! 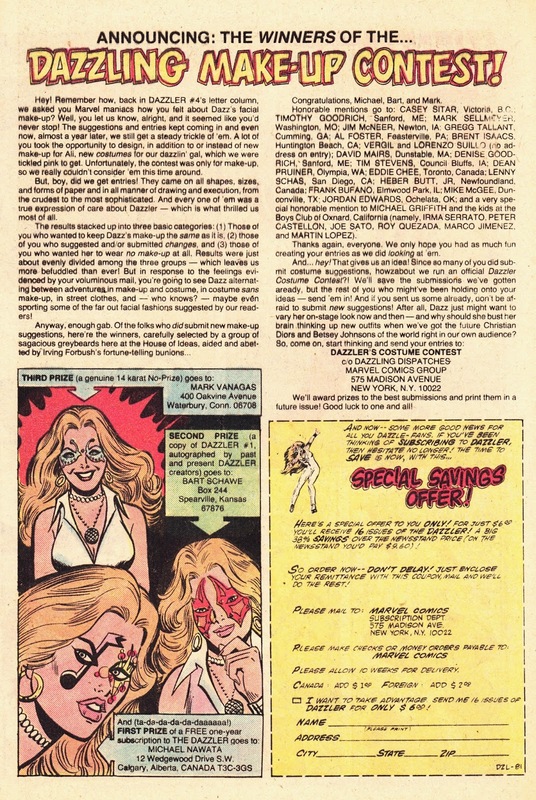 The winners of the Mighty Marvel Dazzling Make-up contest are proudly announced in the 14th issue of DAZZLER's US book. 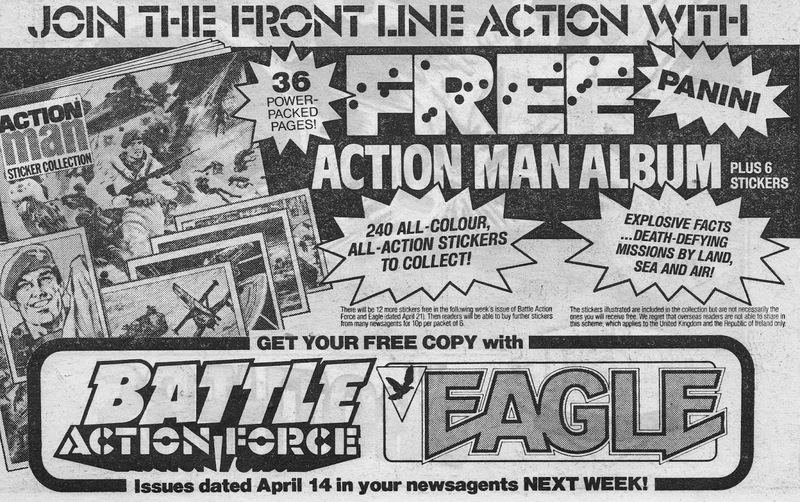 From 1984: An IPC House Ad for impending freebie ACTION MAN STICKER ALBUM (plus starter stickers), the tried-and-tested giveaway in the following week's EAGLE and BATTLE ACTION FORCE. By the time the album came out, my loyalties were aligned to ACTION FORCE (the man's successor) so this seemed something of a throwback. I never collected the stickers... and I've never met anyone else who did. 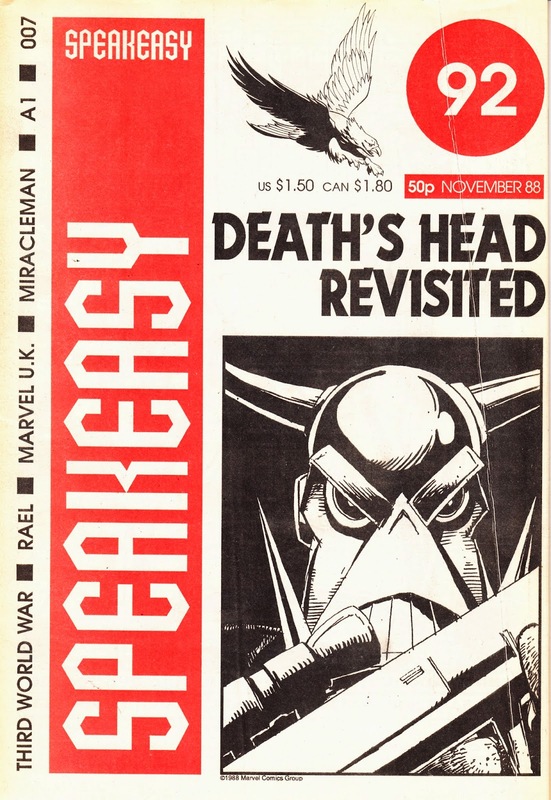 From 1988: UK fanzine SPEAKEASY previews the new MARVEL UK series DEATH'S HEAD in its November issue. 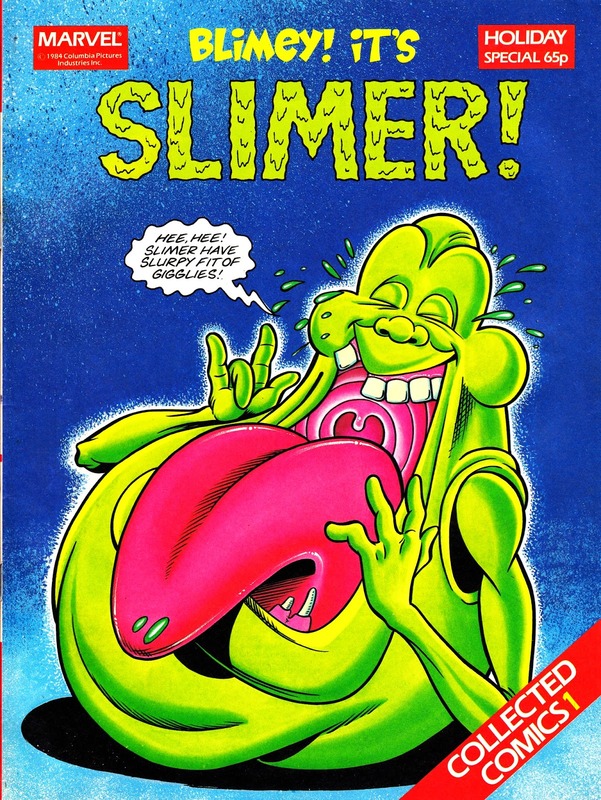 From 1989: more evidence of the REAL GHOSTBUSTERS boom at MARVEL UK: the BLIMEY! IT'S SLIMER! SUMMER SPECIAL. This, presumably, collected material that had previously appeared in the regular comic. The title would return, later in the year, as a new monthly which reprinted material from the US Now Comics tie-in. 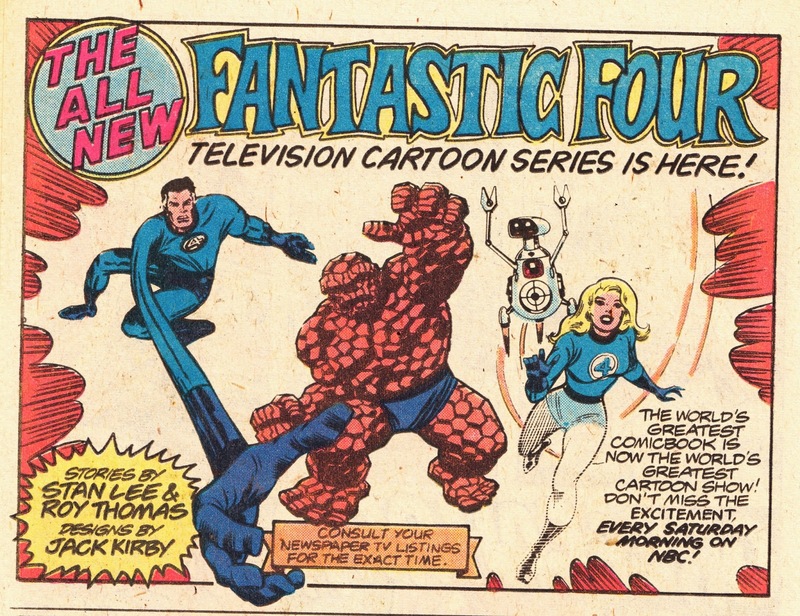 From 1979: A US Marvel Ad for the notorious FANTASTIC FOUR animated series (which aired on ITV in the UK). The absence of the Human Torch has become the subject of an oft-repeated (even by industry insiders who should know better) urban legend. 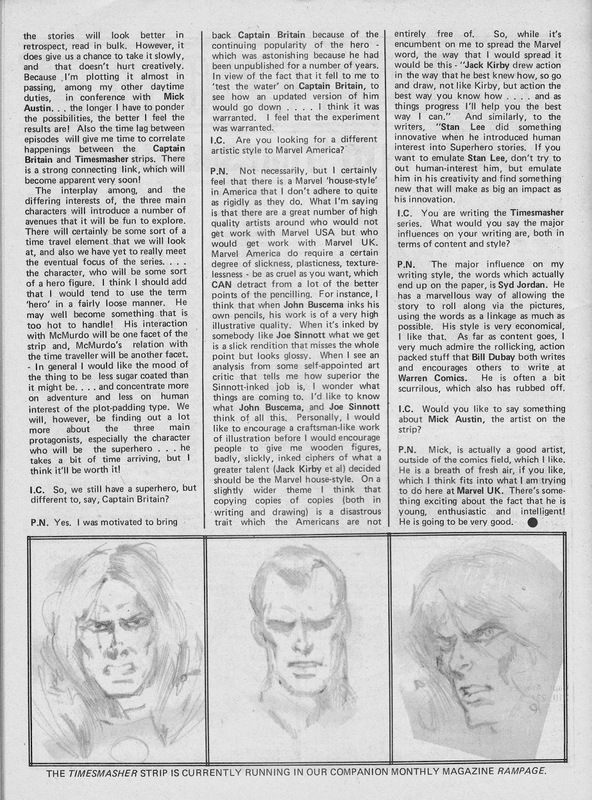 the story goes that NBC's censors panicked at the prospect of the nation's impressionable youth igniting themselves and propelling themselves off tall buildings (John Bryne did an excellent riff on this in a memorable issue of the FF comic book, reprinted in the UK as part of SECRET WARS II) and slapped a 'banned' notice on the character. Not only does that fly in the face of logic but there's nothing to suggest that the character's appearance in the previous incarnation of the show from a decade earlier had induced any dozy pre-teen to try anything similar. The less exciting truth is that Marvel had, as part of the superhero screen boom of the time, already signed-away the rights to the character to Universal in the (optimistic) hopes that Johnny Storm would fly solo in a movie or TV project. When the cartoon producers found out, and mindful of the Star Age impact of the STAR WARS droids, they hot-swapped him for the flying robot HERBIE. Fandom groaned. Stan Lee and Jack Kirby, the foursome's creators, were indirectly reunited on this project as 'The King' was drafted in to provide designs and storyboards for the show... beginning his twilight years tenure in West Coast animation. 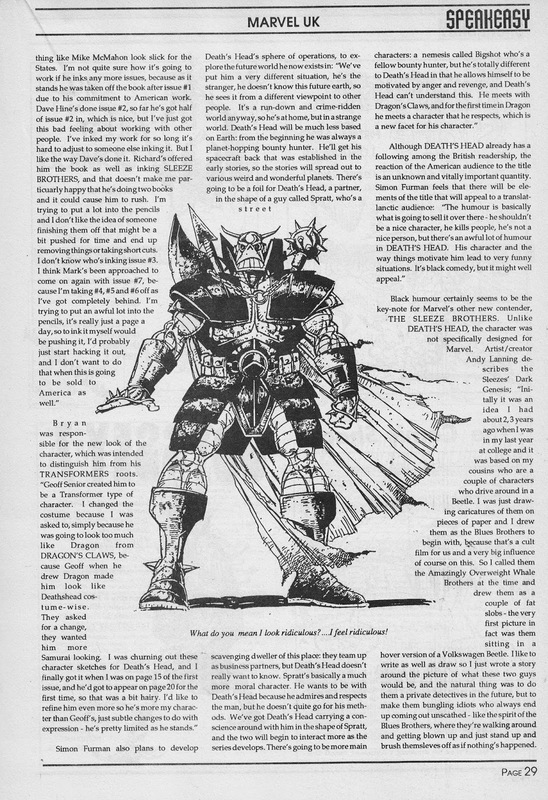 From 1992: The first OVERKILL letters page (remember those?) from the third issue (cover-dated 22 May). 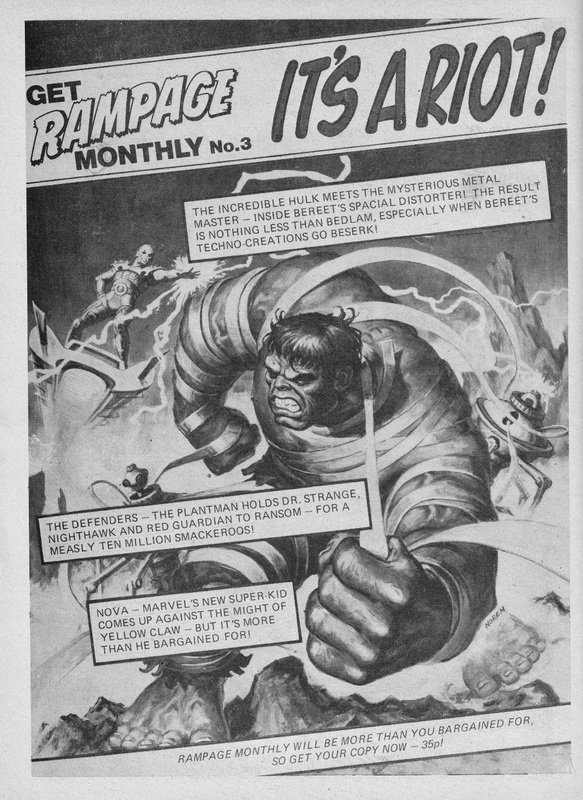 From 1978: More MARVEL UK monthly goodness: a House Ad for the third issue of RAMPAGE. 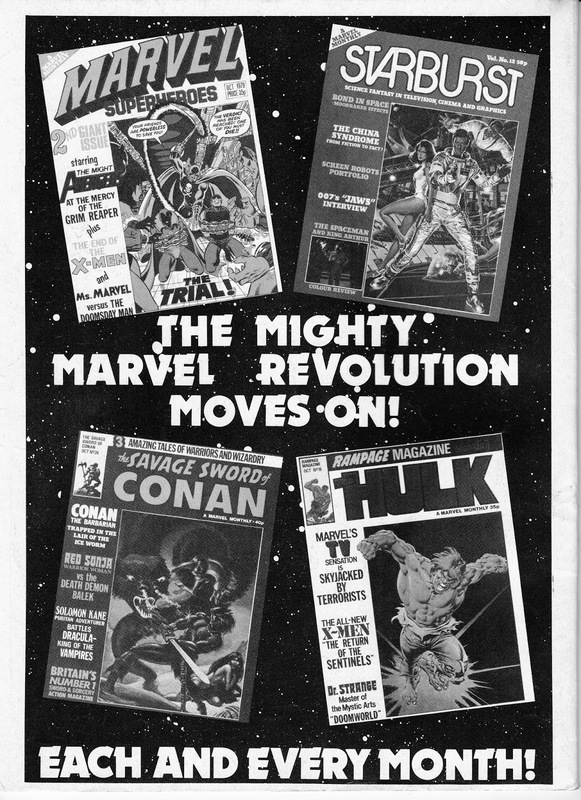 From 1979: A bevy of MARVEL UK monthlies, proudly plugged in this full-page House Ad. 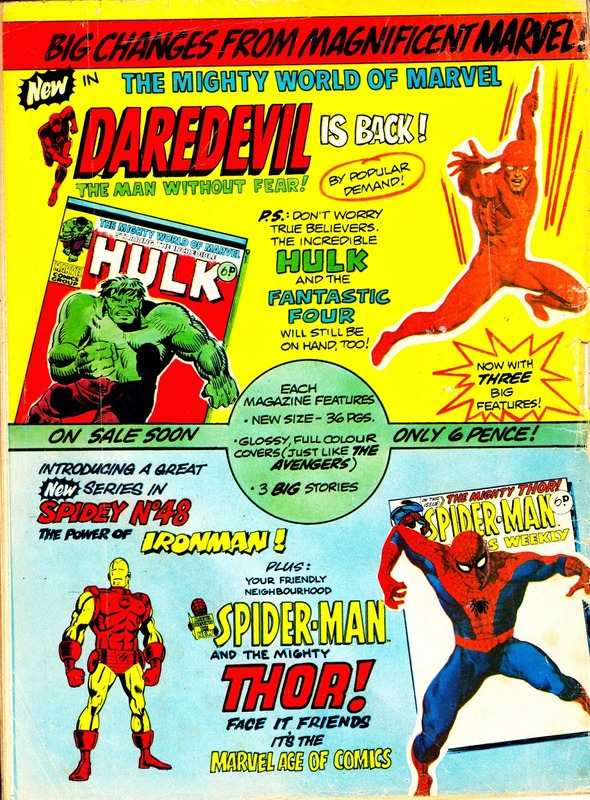 From January 1974: Another Mighty Marvel UK landmark moment: glossy covers! I always think of glossy covers and the defining feature of British Marvel. 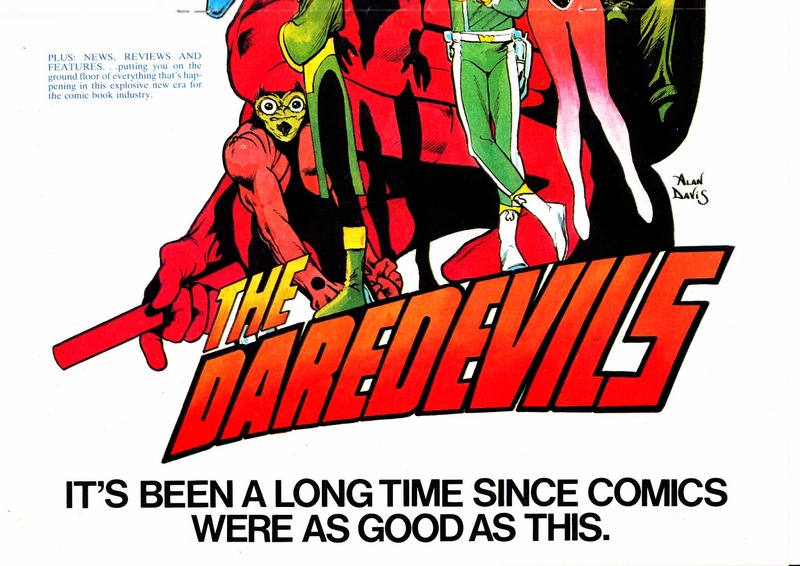 They always helped the line standout when racked alongside the IPC and DCT weeklies and their (usually) bargain-basement production standards (of course, they were investing a lot more in originating new material rather than just recycling from the States). So, it's easy to forget that in the early (and late) Seventies, Marvel's British weeklies had newsprint covers. THE AVENGERS, their third launch (September 1973), was the first to dabble in the new format... and their two existing titles followed at the turn of the year. 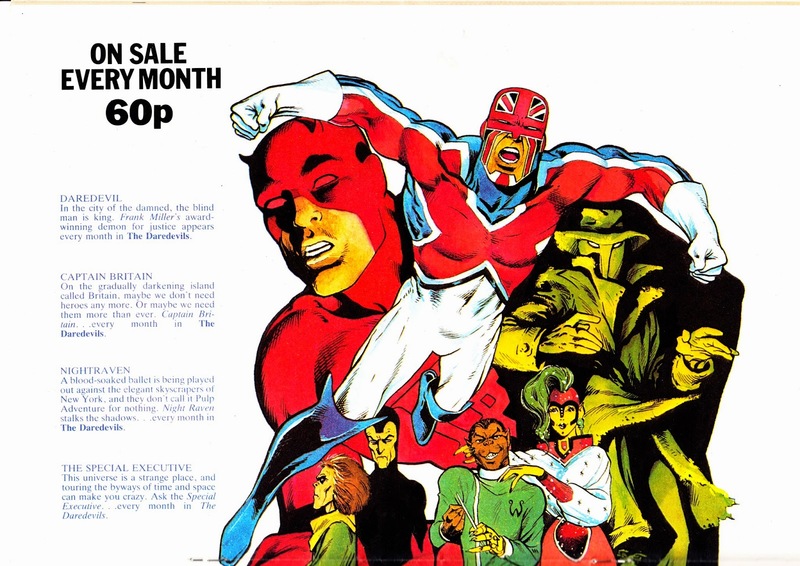 Glossy covers and 36-page interiors remained the default format (with a few exceptions: CAPTAIN BRITAIN sacrificed the glossy covers in favour of colour interior pages, FURY deliberately aped the low-fi formats of its war rivals and STAR WARS WEEKLY sliced four pages to make life easier for the pushed-for-filler Bullpen and to recoup the costs of the license) until the Marvel Revolution of 1979 tried to make Marvel's comics look the same as all the others. 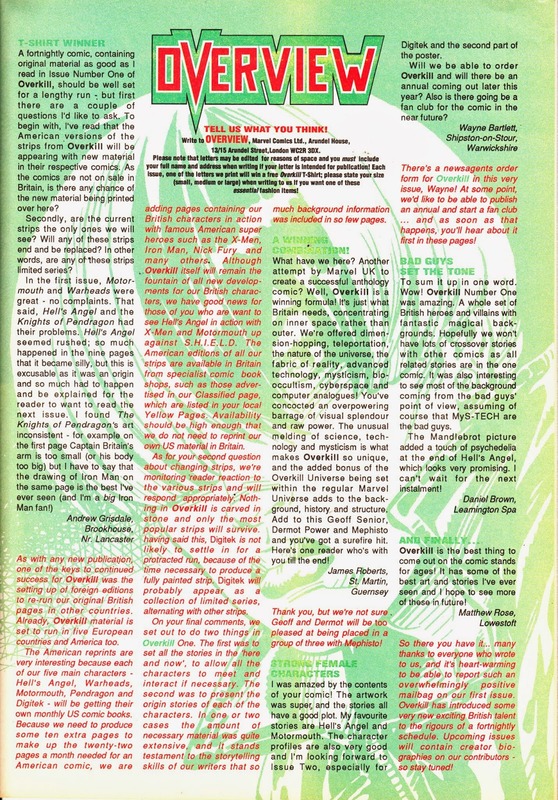 STAR WARS WEEKLY and DOCTOR WHO WEEKLY retained their glossy exteriors throughout the Revolution (because it allowed them to showcase stills to catch the attention of casual browsers) and shiny covers returned (coinciding with the start of the SPIDER-MAN live-action TV show in the UK) in late 1981. They remained, with the occasional exception (the experimental THE THING IS BIG BEN), throughout the rest of the history of the Annex of Ideas... although some formats were more glossy than others. 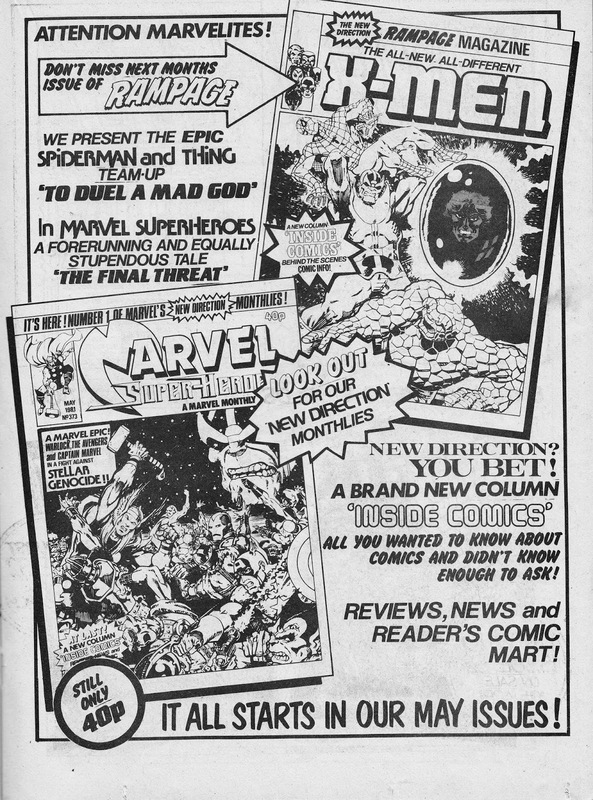 From 1981: A MARVEL UK House Ad for their two super-powered monthlies: RAMPAGE and MARVEL SUPERHEROES. Both were getting a new look (the "new direction") and aiming more at collectors and fans than casual readers. The Inside Comics feature covered a wide range of topics (some penned by Alan Moore) and I've posted a few here in the past. From 1989: A House Ad for MARVEL UK's DROIDS SPRING SPECIAL. 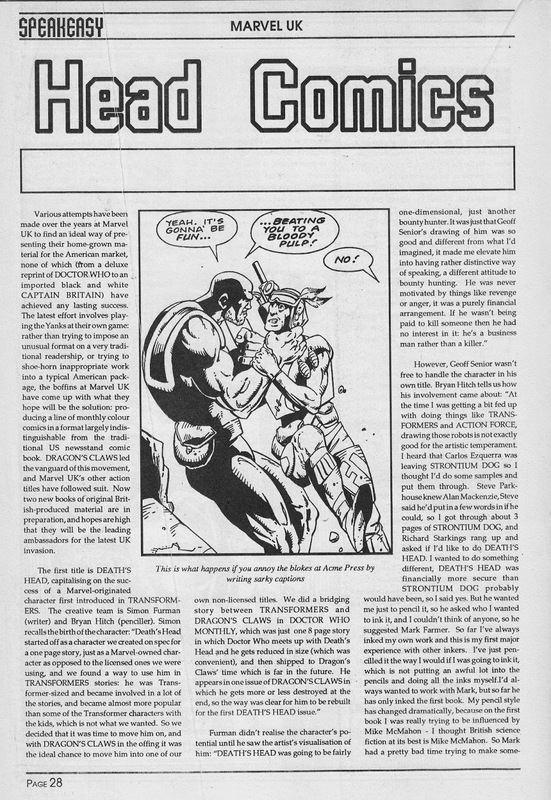 The one-shot, which reprinted the third issue of the brief (8 issues) US Star Comics series, was pegged to the BBC screenings of the animated series (which mustered a single season from September 1985). This marked the last time that the Annex of Ideas would publish a standalone STAR WARS related comic. The long-running title that began as STAR WARS WEEKLY in 1978 shuttered in June 1986 (with a coda in SPIDER-MAN AND ZOIDS post-merger). The very final STAR WARS-related strip to appear in a M-UK comic was also the DROIDS, serialised in the pages of THE MARVEL BUMPER COMIC. They bowed out in issue 25 (cover-dated 25 June 1989). The franchise bounced-back with the five issue run of EWOKS starting in November 1987. It was all over by the following March. 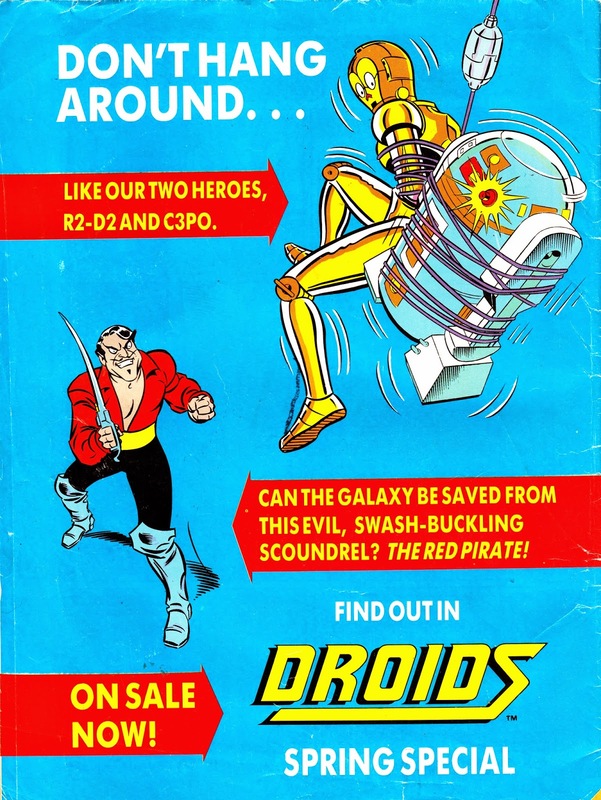 Marvel UK had already published one DROIDS SPECIAL the previous year. 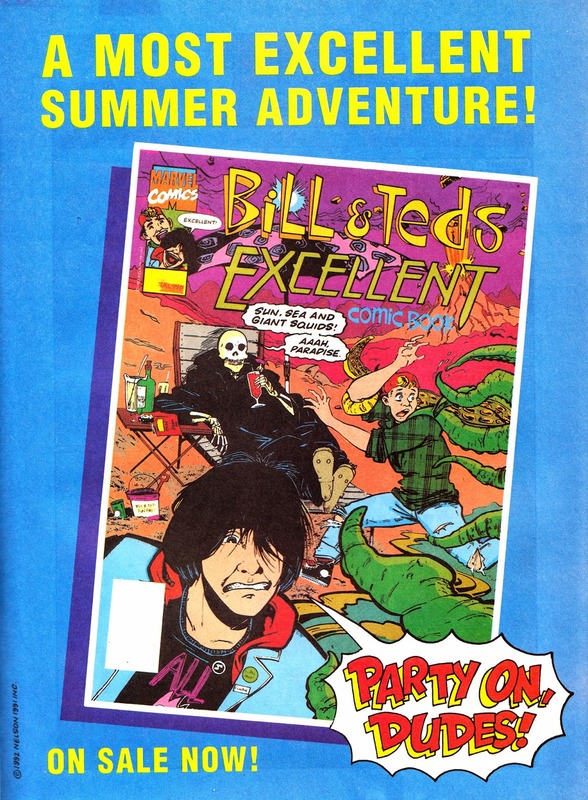 From 1992: Another "well I never knew" from MARVEL UK: BILL AND TED'S EXCELLENT COMIC BOOK SUMMER SPECIAL. This would have been reprints from the US Marvel book (issue 2, judging by the cover) which ran for twelve issues between 1991-92. The comics were based on the animated series which was based on the two feature films. Phew. The title is unusual: the term "comic book" wasn't (isn't?) generally used in the UK but the Bullpen ported the name directly across from the American run. 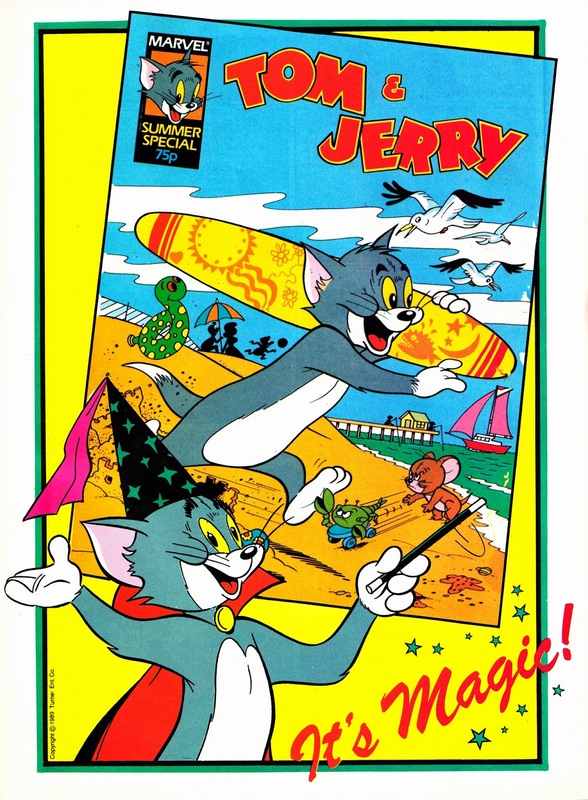 From 1989: A House Ad for another obscure one-shot from the vaults of MARVEL UK: The TOM & JERRY SUMMER SPECIAL. These are characters that I most associate with TV COMIC (which shuttered half-a-decade earlier) so it comes as a bit of a surprise to find out they also had a residency at Arundel House. From 1983: More gifts direct from the hallowed halls of MARVEL UK. The launch of a new weekly was always a good excuse for three to four weeks of gifts (kids today don't know they were born... dozens of gifts with EVERY issue! ), usually of decreasing cost to the publisher as the weeks wore on. With two new titles on the go (THE MIGHTY THOR... swiftly followed by THE X-MEN), there were even more goodies to be had. However, Marvel obviously didn't want readers to start defecting from SPIDER-MAN (or wanted to replace any that bailed out) so they also pushed the boat out for a Spidey pin-badge. 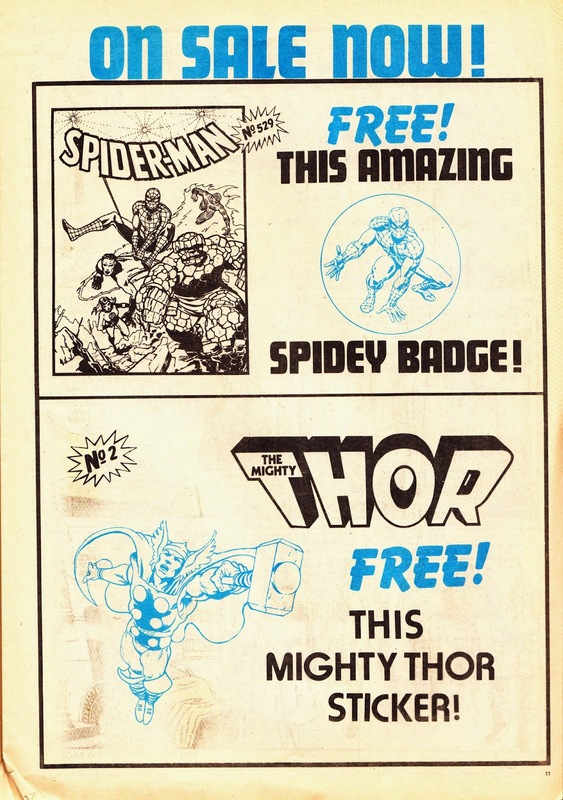 From 1983: MARVEL UK loved to give away paper-based products as freebies. Not only did they cost next-to-nothing to make but they also avoided the hassle of having to employ someone to tape them to the cover. 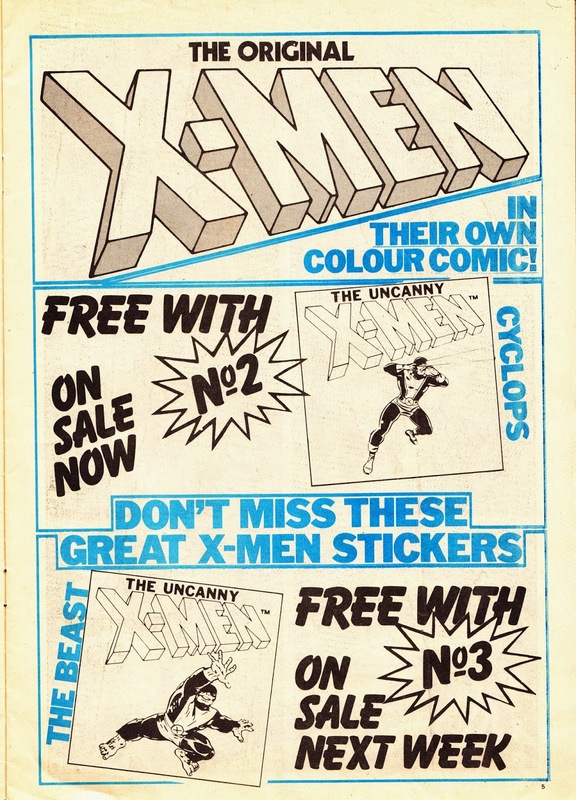 Case-in-point: the second and third issues of the short-lived 1983 X-MEN weekly (plagued by Marvel's new Crappo Colour technology) came with free loosely-inserted X-stickers. These, of course, were guaranteed to part company with the comic when displayed vertically on the shelves... forcing the would-be buyer to first vigorously shake the comic and then, upon discovering its absence, scrabble around the shelves to try and find it. This could also, depending on the display, unveil a treasure-trove of other gifts and inserts which had long-since parted company from the comics they were intended for. And, of course, unscrupulous buyers could slide inserts from other copies into their own and walk away from the till with multiple inserts tucked inside. Marvel went for economies of scale by getting several batches of stickers made at once... around the same time THOR (which launched two weeks ahead of THE X-MEN), the revived MWOM, SPIDER-MAN and possibly others all boasted free stickers. 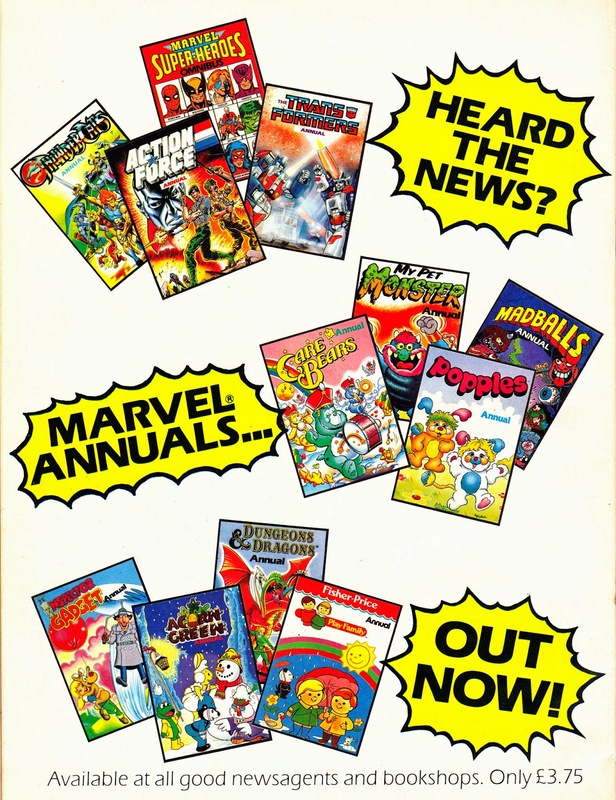 From 1987: a cavalcade of MARVEL UK ANNUALS. It says a lot that there's no SPIDER-MAN ANNUAL in the bunch... that's how far the mighty had fallen in the second half of the eighties. The MARVEL SUPERHEROES edition was, however, an excellent alternative and must rank as one of the very best single annuals of the Star Age. The rest are a motley bunch of licensed titles... and equally good indicator of the direction of travel for the Annex of Ideas... and the state of the annuals business. 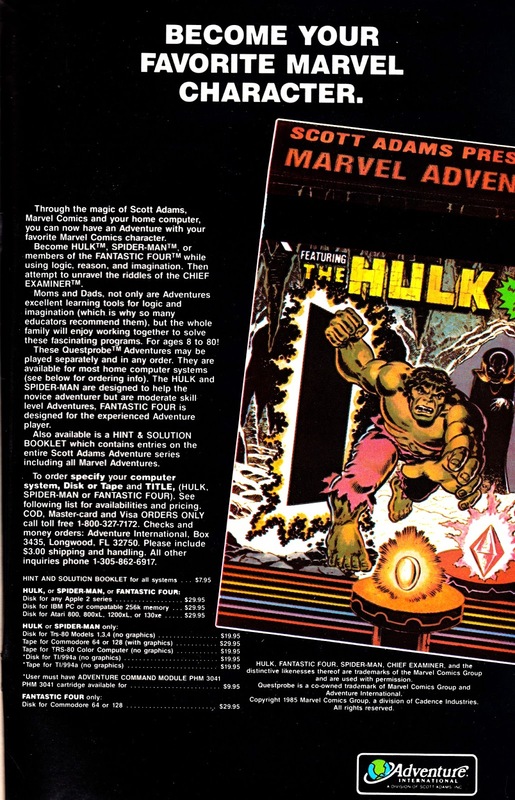 The ACTION FORCE edition was the first from Marvel UK... and also the first time the Force had gone solo in a yearbook. The previous three years had (logically enough) seen them sharing the pages of the BATTLE ANNUAL from Fleetway. Unlike the previous years, this was (with the exception of a new text story) an all-reprint affair, drawing on the US G.I. JOE strips. THE TRANSFORMERS ANNUAL was the third, and the first year that the movie characters had featured. For some... this marked the end of the golden age of the Robots in Disguise. THE THUNDERCATS edition was the second, spun-off from the popular weekly, toys and animated series (aired on the BBC). The seldom seen DUNGEONS AND DRAGONS book, presumably (like the one-shot special I've covered before), reprinted the Spanish strips based on the Marvel Productions TV show. The rest, pitched at younger readers, are all based on toy or animated (or both) characters. I think the INSPECTOR GADGET (who I'm sure also had a slot in LOOK-IN... although I don't know if the two licenses overlapped) strips also came from Europe. ACORN GREEN was a toy line that also had it's own Eco-themed comic from the British Bullpen. POPPLES, CARE BEARS and MADBALLS all had Star Comics in the States. MY PET MONSTER was another toy tie-in which spawned an animated series (and straight-to-tape movie). 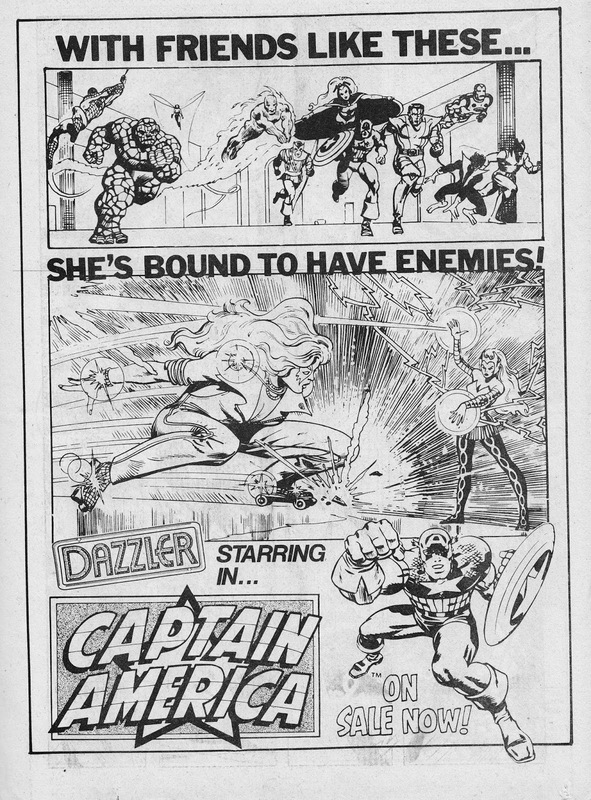 From 1981: DAZZLER gets a moment in the spotlight when MARVEL UK pick her out of the pack (which also included Iron Man and the Defenders) as a good reason why people might want to buy the new CAPTAIN AMERICA weekly. This House Ad appeared in April. 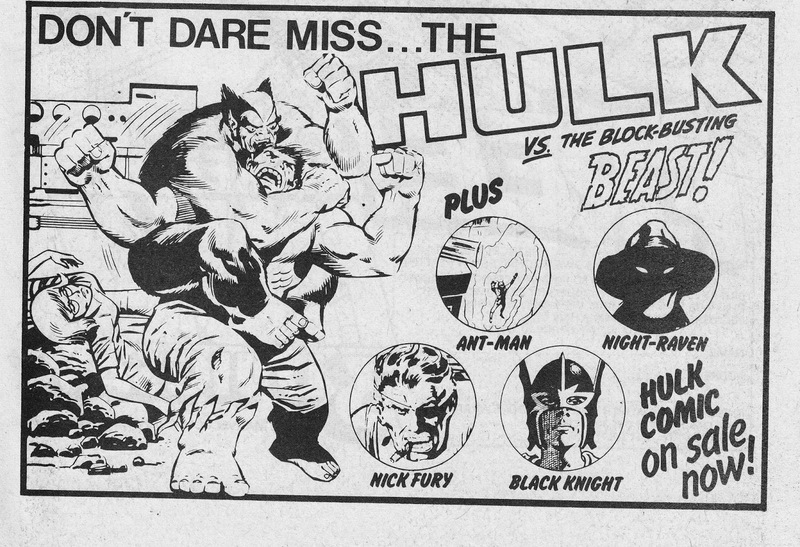 From 1979: a half-page House Ad for MARVEL UK's HULK COMIC. This is from March 1979. 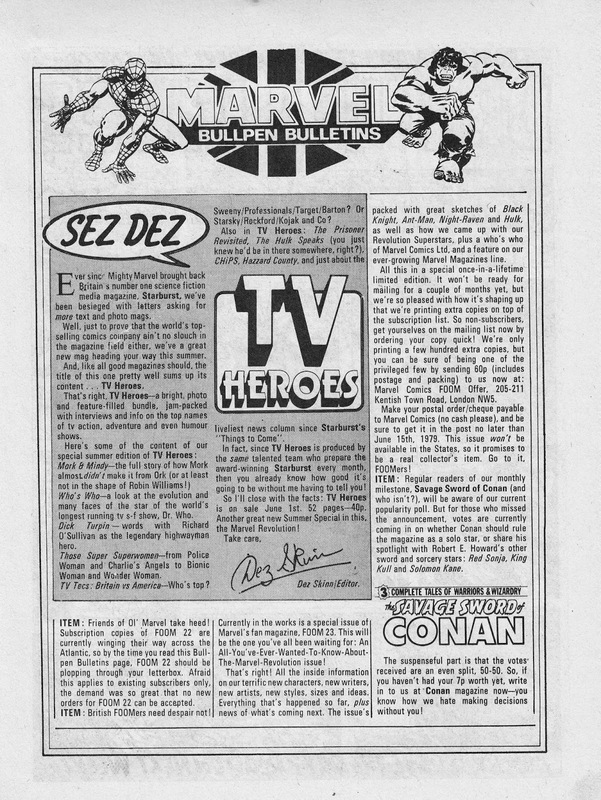 From 1979: The British Marvel Bullpen Bulletins page plugs the delights of Dez's TV HEROES, a STARBURST-alike which intended to expand the franchise to cover general small screen shenanigans. The project never progressed beyond the pilot (a familiar TV tale) which either means that sales and trade reaction was stunning enough to make it viable. Or the British Bullpen concluded that the amount of effort involved in putting together another magazine (or top of the weeklies and monthlies) just wasn't possible. 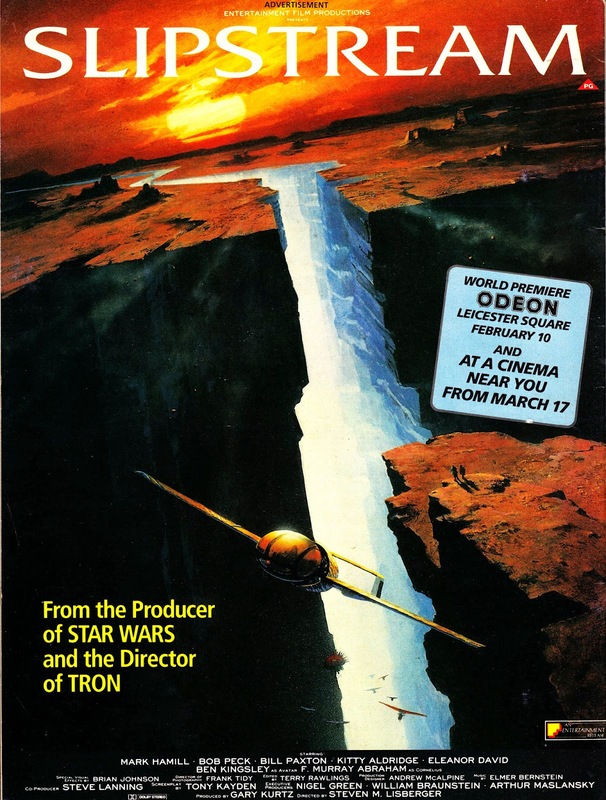 There's also another plug for FOOM issue 23... another much-hyped project that ultimately failed to fly. 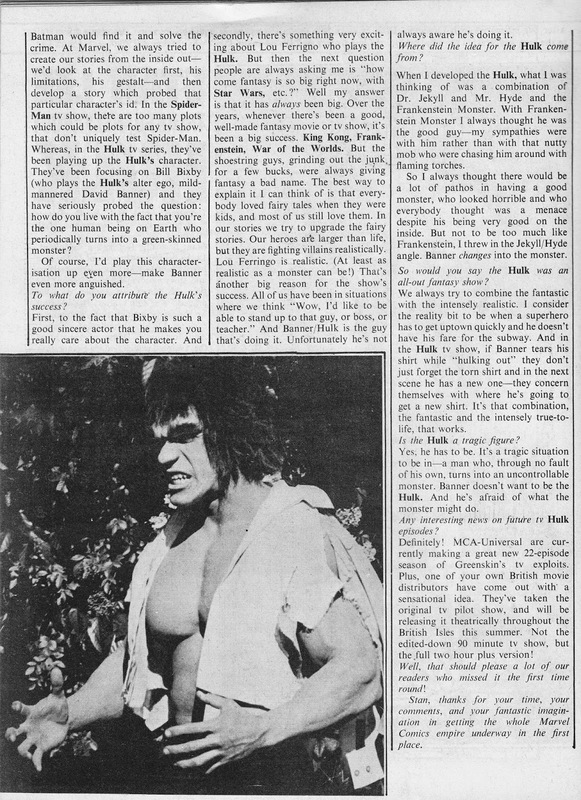 This appeared in MARVEL COMIC issue 344 (30 May 1979). 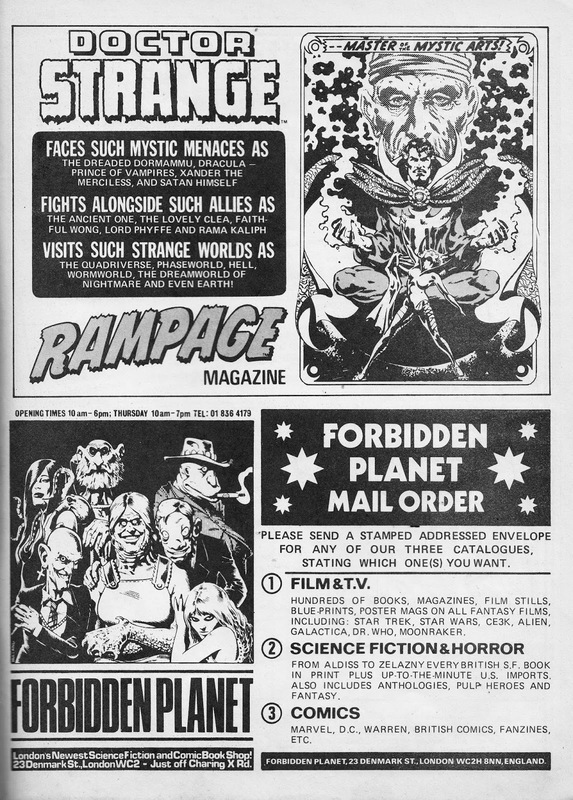 From 1980: Doctor Strange graces the pages of RAMPAGE MAGAZINE and FORBIDDEN PLANET offers Mail Order wares for those not lucky enough to make the pilgrimage to their Central London store. 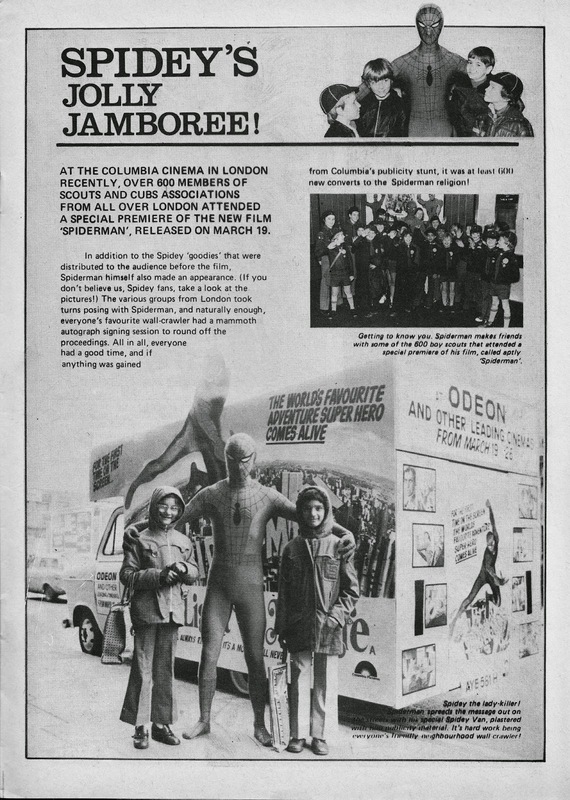 From 1978: Coverage from the SPIDER-MAN weekly of a special suspiciously sexist cinema screening of the first (of three) Spidey faux feature films. This appeared in issue 272, 26 April 1978. 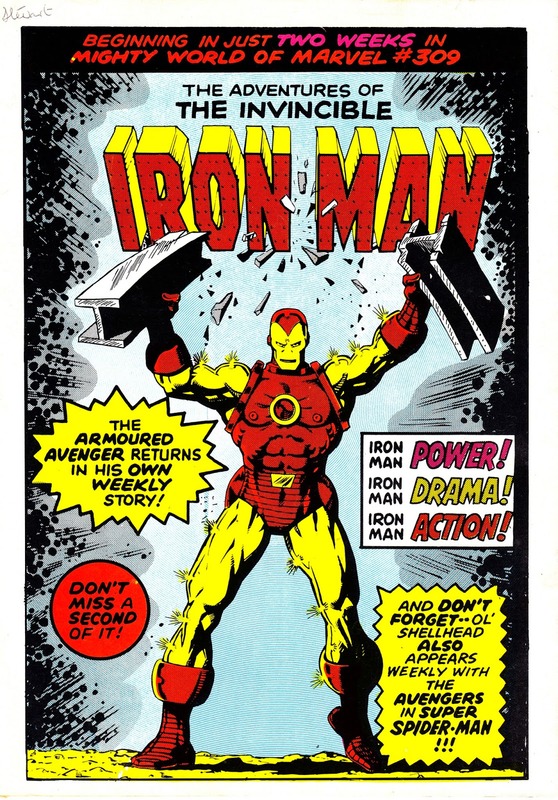 From August 1978: MARVEL UK announces the return of Iron Man, in the pages of THE MIGHTY WORLD OF MARVEL. As well as his continuing slot in the Avengers... currently booked into the pages of Spider-man's weekly. I imagine some readers had to re-read this... it does, at first glance, look awfully like the announcement of an IM solo title. 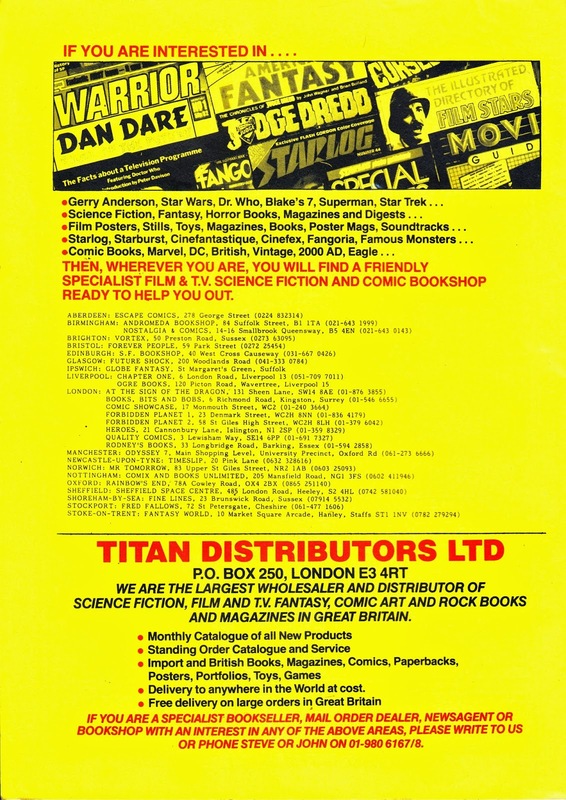 From October 1984: a list of UK comics specialist stores serviced by Titan Distributors. It's not a very long list... but the industry had yet to reach its peak (fast-forward about nine years) and Titan (now part of Diamond) wasn't the only player in the field. This appeared on the back cover of FANTASY ADVERTISER issue 87. 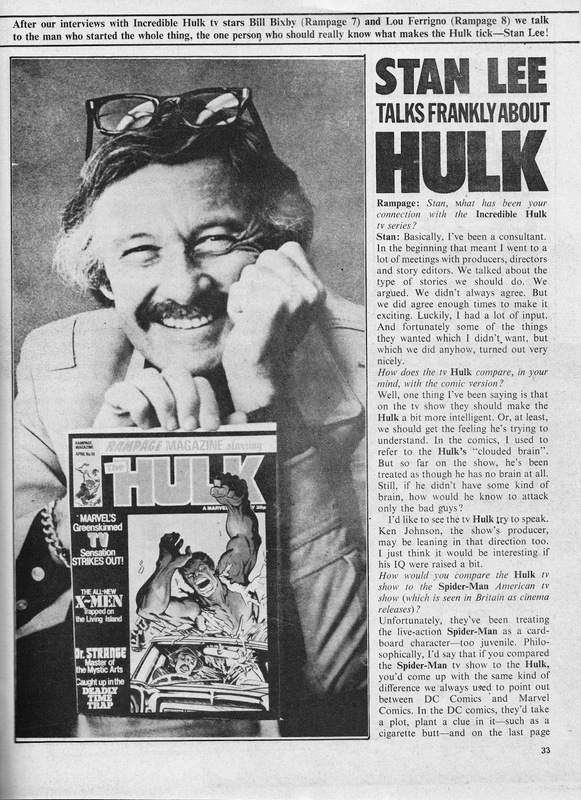 From 1979: Stan Lee talks HULK for MARVEL UK's RAMPAGE MONTHLY issue 11 (May). It looks like this might be an original piece for the UK. Or, at least, an amended American interview with new copy added to plug the UK release of the pilot episode as a faux feature film. Although, it actually happened the following year (see: here). 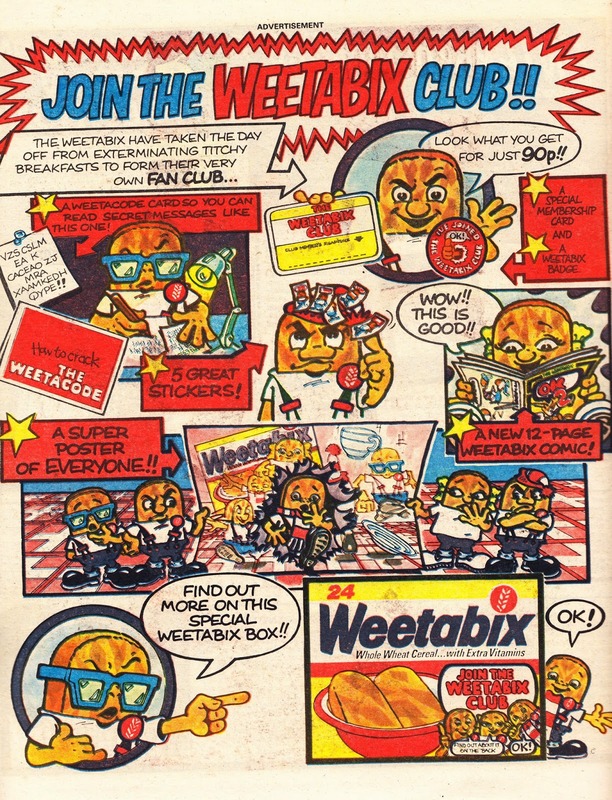 From 1983: A chance to join the WEETABIX FAN CLUB... and I did. Fan Clubs were, in the pre-internet age, a tried-and-tested way of reaching out to young consumers and buying their ongoing loyalty with the obligitory membership kit (see above) and the occasional mail-out when you have something specific to flog or feel you need to remind your membership of their loyalties. I was never a great fan of Weetabix... but it was the breakfast table staple when I was little. So, of course, I signed-up for the club. And, although long since lost, I seem to remember the membership kit was pretty cool. And I'm fairly sure they sent out further issues of the comic for at least a little while. This ad appeared in a December copy of the EAGLE. 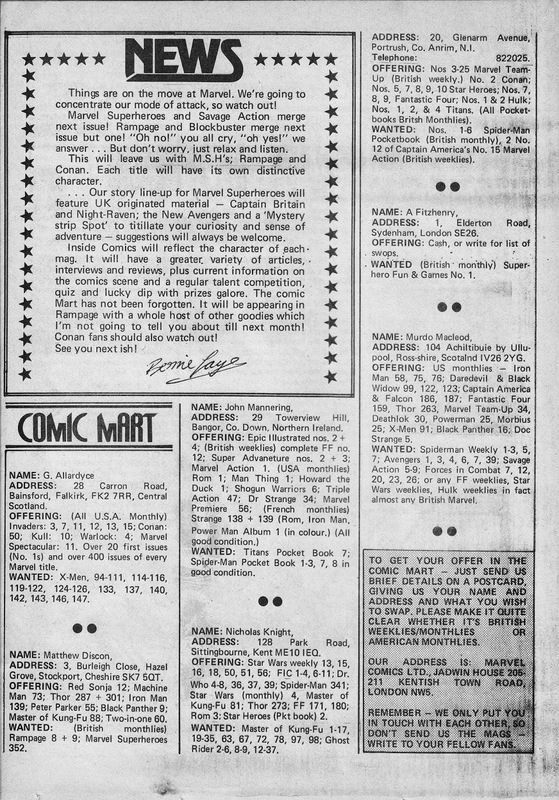 From 1984: STAR WARS mail-away-for-a-fat-man offer. 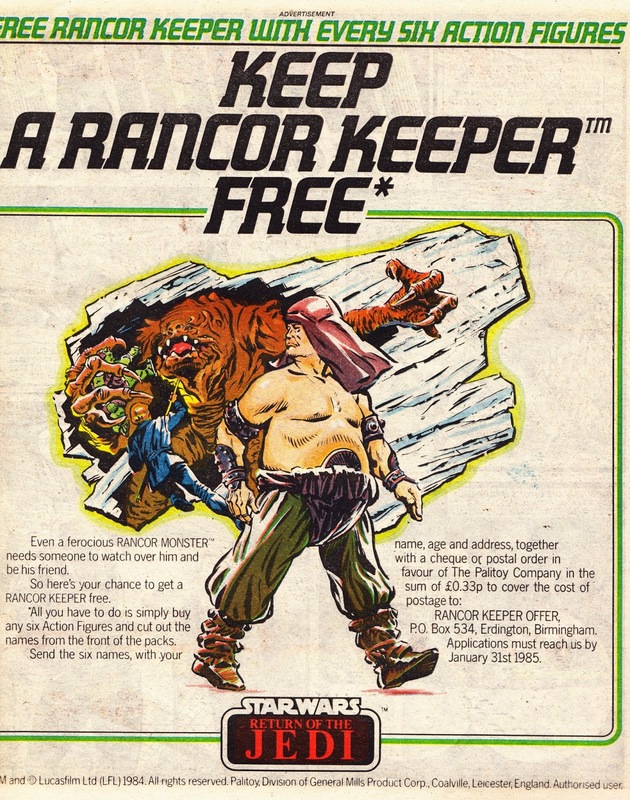 The Rancor Keeper was not the most figure-friendly character lurking in Jabba's desert palace... but Palitoy still thought it was the ideal choice for its latest send-for-a-figure promotion. Maybe they thought they stood more chance of shifting this duffer by making it seem like a premium item rather than exposing it to ridicule in the nation's discount dump bins... Or maybe they hoped that this would help shift more Rancor Monster toys. This particular advert, which appeared in September, is from a copy of the EAGLE. 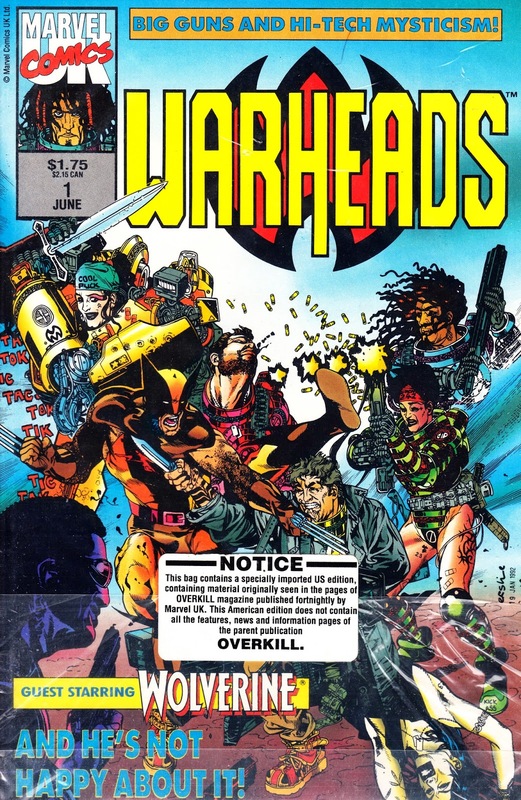 From 1992: WARHEADS issue 1, the official start of the MARVEL UKverse! This copy is still bagged and sealed with the original "Genesis Seal", a brief scheme by the British Bullpen to cross-promote the new fortnightly OVERKILL, an anthology of the original "Genesis Five" books (WARHEADS, MOTORMOUTH, HELL'S ANGEL, THE KNIGHTS OF PENDRAGON and DIGITEK). 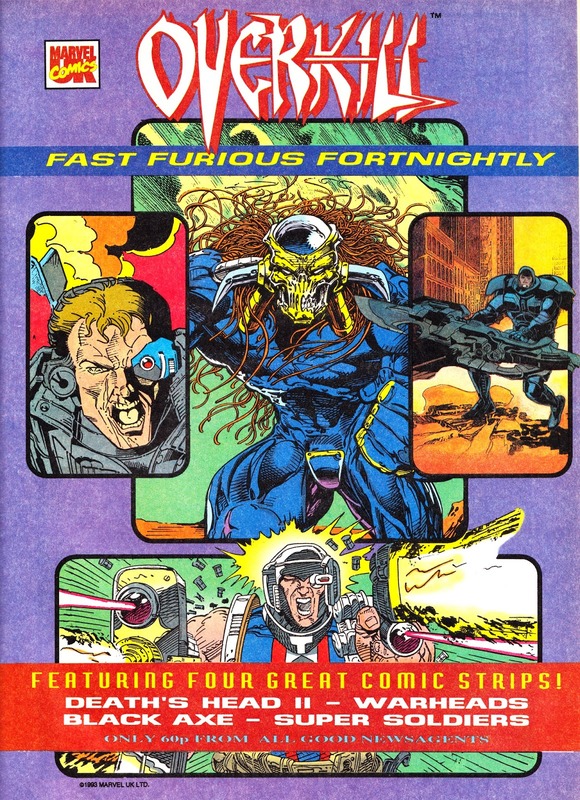 What the sticky plug neglects to mention is that, in terms of strips, Overkill readers were under served: The US editions contained twice as many strip pages that each story received in Overkill. But... were the Overkill versions (heavily) edited... or were the US versions padded? Warheads were a team of dimension-jumping mercenary scavengers employed by Mys-Tech (the hitherto unknown movers and shakers of this part of Marvel Earth) to jump between worlds and dimensions to grab new technology for the benefit of their employers. A really nice idea oft-undermined by their continuing encounters with existing sales-boasting Marvel characters. Nick Vince was the writer, Gary Erskine supplied the stunning art and John Freeman was editor. 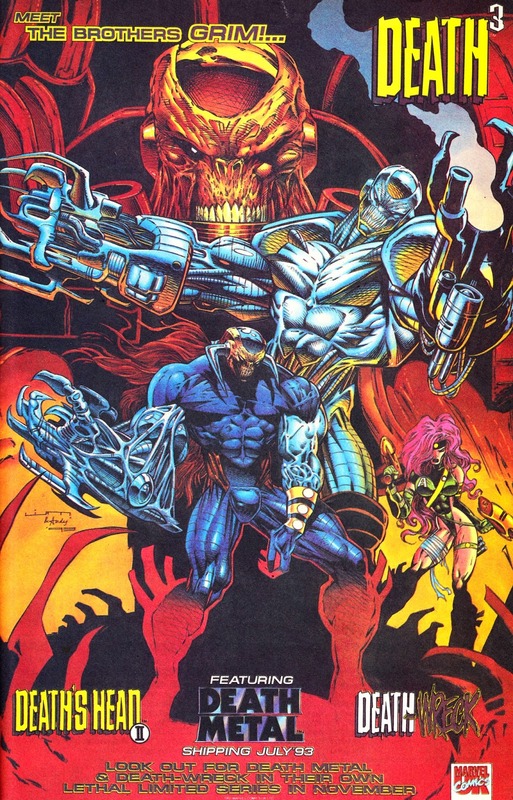 The book eventually ran for fourteen regular issues and a two-part limited series. Plans for more were terminated (without mercy) in the Genesis Massacre. From 1989: a UK print advert for the odd little post-apocalyptic adventure movie SLIPSTREAM, a rare post-STAR WARS leading role for Mark Hamill. 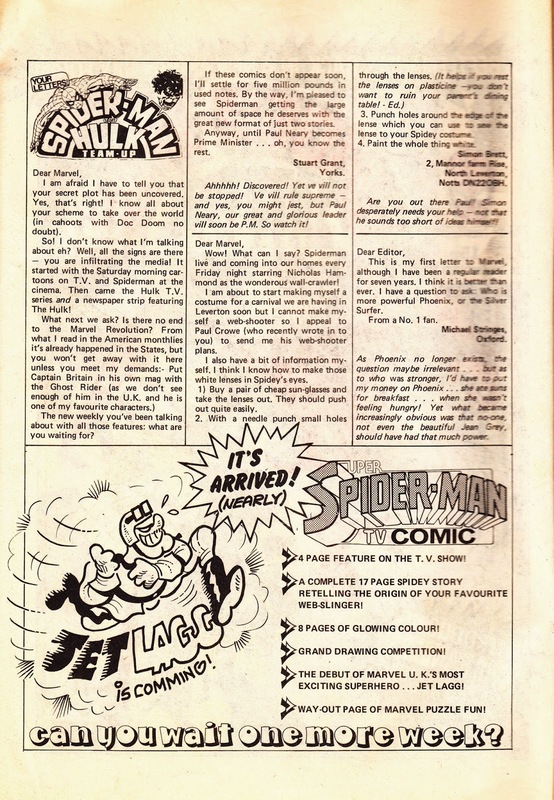 From 1981: Another impending relaunch for MARVEL UK's venerable SPIDER-MAN weekly. This time cannily timed to coincide with the long-delayed debut of the live-action CBS TV show on ITV... a marketing opportunity too good to resist (even if the new title, SUPER SPIDER-MAN TV COMIC, did sound like an odd amalgam of past incarnations and a long-running rival). Oddly... they neglect to mention that the new format would see the return of glossy covers... and glossy centre pages for the first time. It would also mean the departure of the rag-bag of recent mergers (HULK and MARVEL TEAM-UP) which were filling the back pages and making for a very unwieldy (and not very accurate) masthead. From November 1993: Another House Ad for MARVEL UK's OVERKILL... boasting a very different line-up than the one it launched with the previous year (only WARHEADS were holdouts from the original 'Overkill Five' strips). It switched from fortnightly to monthly just after this ad appeared... a peripheral victim of the GENESIS IMPLOSION which cut a large chunk out of the US line... but didn't reverse (or even stabilize) plummeting sales across the board. From 1994: a MARVEL UK House Ad/ Subscription driver for the BLAKE'S SEVEN and DOCTOR WHO POSTER MAGAZINES, two titles that seemed curiously behind-the-times. Not only were both shows defunct but the idea of Poster Magazines also seemed like a Seventies throwback. 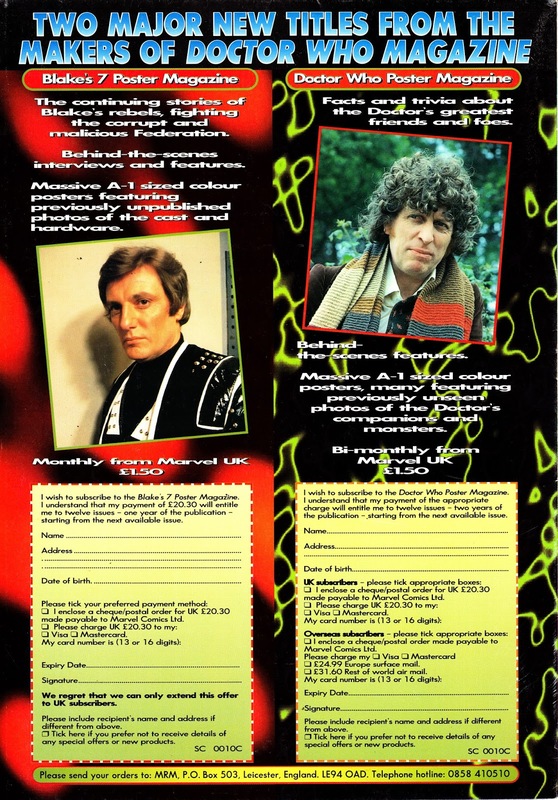 This ad continued to appear in both titles (and other M-UK books) throughout the short runs of both magazines. I've previously covered the B7 PM's here and here. From 1983: MARVEL UK devoted the centre-spread of SPIDER-MAN issue 533 for a glossy plug for their DAREDEVILS monthly. Come to think of it... it does look pretty appealing. This appeared in May and DD was defunct by November. It mustered only 11 issues before folding into THE MIGHTY WORLD OF MARVEL. From 1984: the annual Fall Kid-Vid plug from CBS, as seen in multiple US comics. This was clearly a year where video games (and Role Playing games) held sway with SATURDAY SUPERCADE, POLE POSITION and DUNGEONS AND DRAGONS. Younger kids were catered for by the Emmy-grabbing MUPPET BABIES and THE GET ALONG GANG (Conform. Conform. Conform). 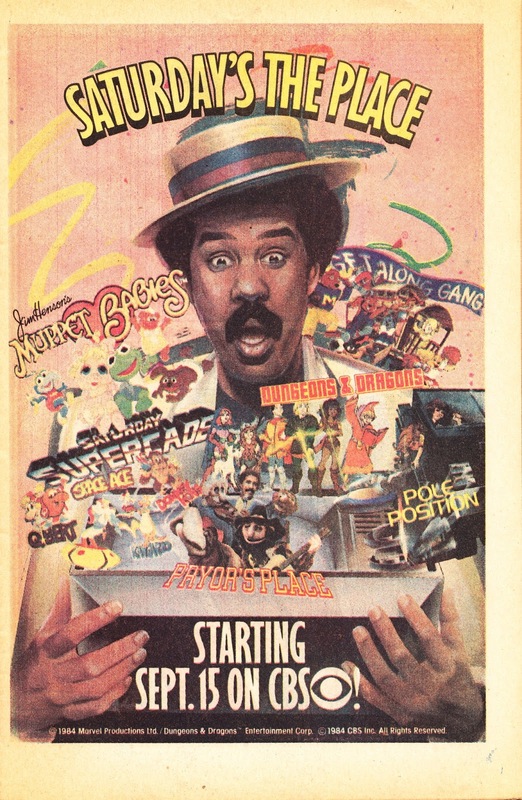 PRYOR'S PLACE, starring Richard Pryor, never crossed the Atlantic. Surely a surprising choice for a Saturday morning TV star, coming only four years after the potty-mouthed multi-award winning comedian and actor had set himself alight whilst freebasing cocaine. From 1986: A text-tastic US ad for the QUESTPROBE Marvel video games. Marvel had big plans to support this series with regular new comics pegged to the latest in the ongoing games releases (the first was also released as a MARVEL UK one-shot) but, unfortunately, the games company went bust and the deal disintegrated. 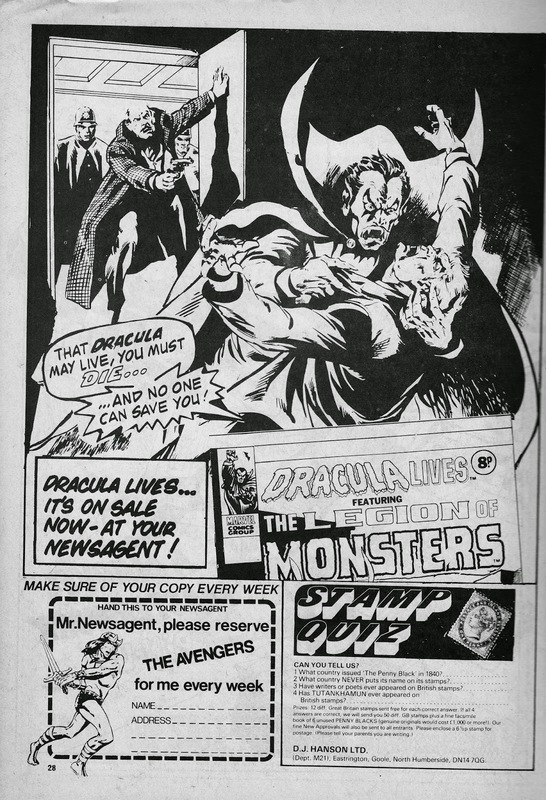 From 1976: A MARVEL UK House Ad for DRACULA LIVES (currently featuring The Legion of Monsters). This appeared in early February. From 1982*: the British Bullpen Spin Machine cranks up again to put a positive gloss on the demise of SAVAGE ACTION Monthly after fifteen issues. SA was a "mature readers" comic before the term had been invented... a hotch-potch of adventure and horror fare assembled (for the most part) from the US black & white magazine line. As Bernie says, putting a brave face on it, SA was about to fold into the pages of MARVEL SUPERHEROES from 382. 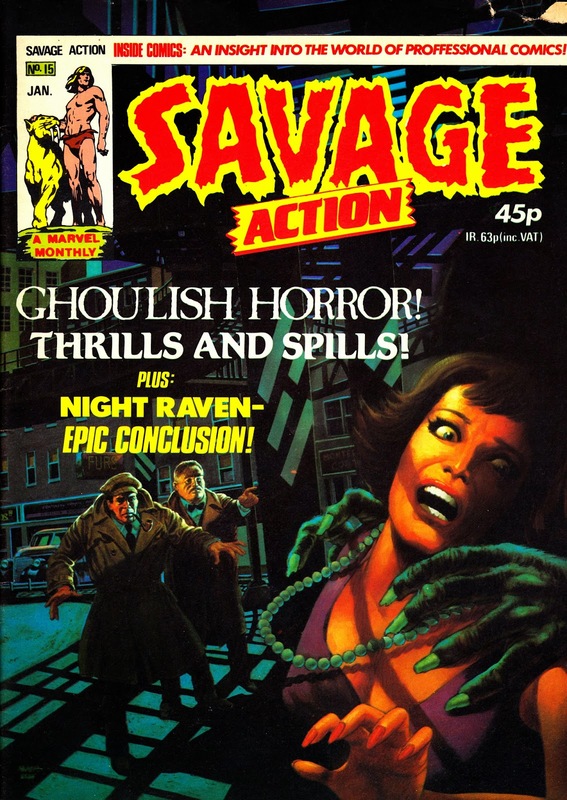 Which also happened to be the only issue to officially incorporate SA although the Night Raven text stories (the only survivor to emerge from the wreckage of SA) did continue. * This would have gone on sale in December 1981.